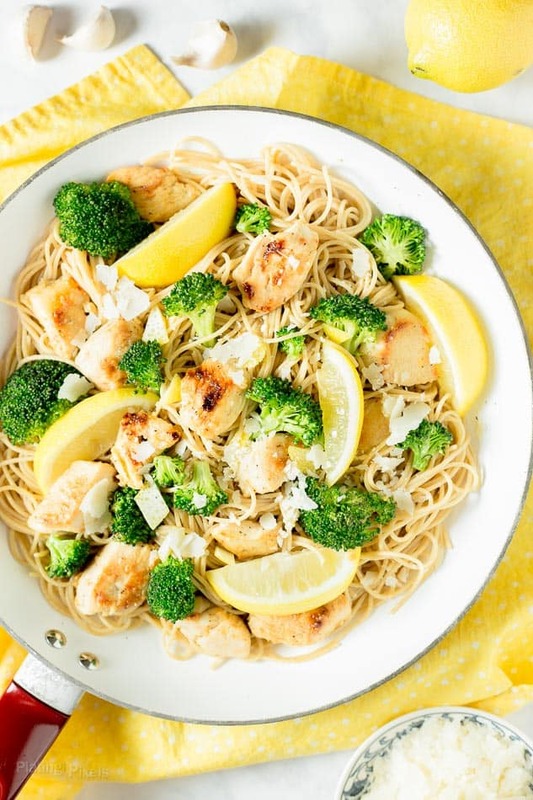 Quick and healthy Lemon Chicken Pasta with Broccoli. Crisp broccoli florets, garlic, lemon juice and zest with sauteed chicken and whole wheat pasta…all in less than 30 minutes. 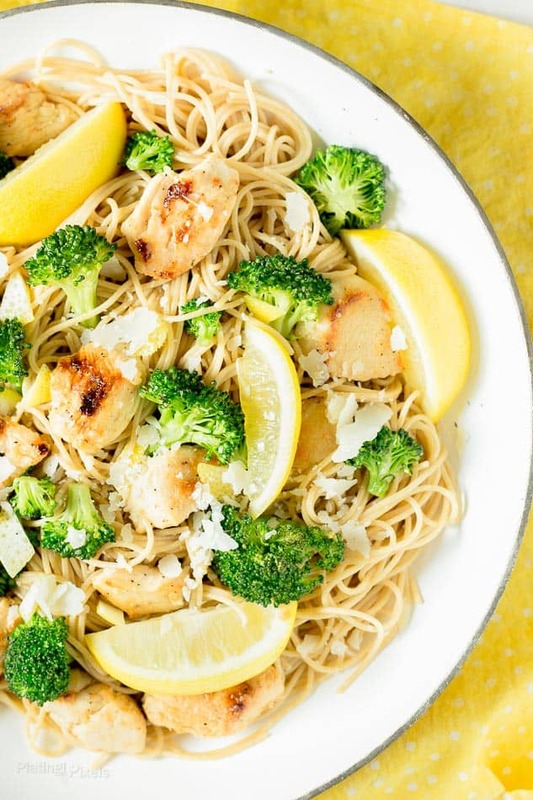 Within this post, you’ll make a lightened up lemon chicken pasta that’s full of fresh flavor. Plus you’ll learn the skinny on whole wheat pasta. Triple lemon. Yep, we’re going all out with this chicken pasta recipe. I’m focusing more on fresh, light and healthy recipes. Seasonal produce brings new ingredient options, and lemon broccoli is an ideal pairing of rich flavors that fit a better for your lifestyle. This pasta is not only delicious but super quick to whip up. Cutting chicken breast into smaller pieces reduces cooking time and also creates more surface area for browning. Just top with a bit of fresh grated Parmesan cheese for a simple meal ready in less than 30 minutes. The textures, flavors, and aromas will have you smiling as you’re transported by the sensation of a cool summer breeze and fresh lemon scent. 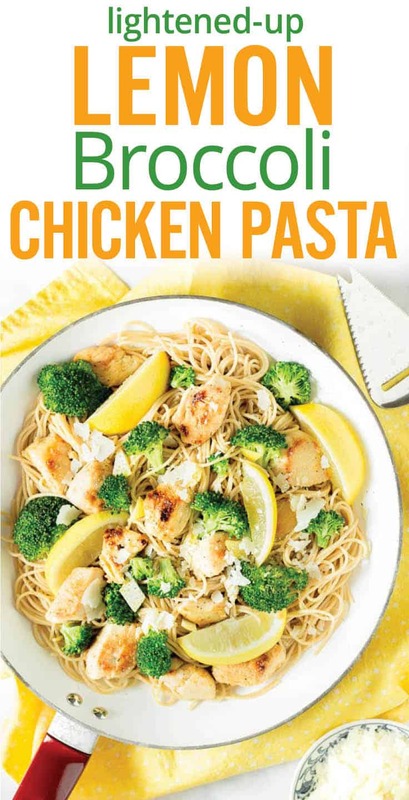 On that note, this Lemon Chicken Pasta also works as cold pasta salad and packs well for a unique picnic or potluck dish. Use good quality chicken, preferably organic or free range for the best flavor. Use shaved or shredded parmesan. The powdered kind does not have optimal flavor or texture. Make sure not to overcook the broccoli as it will have a mushy texture and lose nutrients. A bit of crunch is preferred. Cut the chicken into even sized pieces so they cook at the same time and brown better. Leftovers will store well in the fridge to be eaten cold the next day as a pasta salad. Make this dish gluten-free by swapping whole grain pasta for a gluten-free variety such as rice noodles. If you’re making this pasta dish to eat cold as a pasta salad use a short whole grain pasta shape as it’ll be easier to eat cold than spaghetti. If you do use long pasta and have leftovers, try adding a touch more olive oil before serving if the pasta is sticking slightly. Cook the pasta al dente (slightly tender) so it has a nice firm texture and isn’t mushy. Cook pasta according to package directions. Cook al dente (firm), remove from heat and drain. Stir in 1-tablespoon olive oil to prevent sticking. Meanwhile: Cut chicken into cubes and toss with lemon pepper seasoning. Heat olive oil in a large pan or skillet to medium-high heat. Add chicken pieces and cook, stirring often until opaque and mostly cooked. Turn heat to high and add garlic. Stir often and cook until until chicken is lightly browned. Remove chicken from pan. Reduce heat to medium-high and heat remaining olive oil in a pan. Add broccoli and saute. Do not over-cook as broccoli should be crisp. Remove from heat and stir in lemon juice, lemon zest, cooked chicken and pasta. Serve with Parmesan as garnish. Why use whole grain pasta and what is it made of? Whole wheat pasta contains a lot of B vitamins and minerals such as magnesium, copper, and selenium whereas white refined flour pasta contains no minerals. Whole grain also contains a lot more digestible fiber making it lower in calories than regular white pasta so it’s a much healthier option. Whole grain pasta includes all three layers of the wheat kernel: the bran, the germ, and the endosperm. Because it is not refined, it includes valuable fiber and nutrients. Enjoy as part of a balanced meal, plus extra fiber has the added benefit of making you feel full longer. If you require gluten-free, there are alternatives, including corn, rice and oat based pastas. Use organic or free-range chicken breast for best flavor and health benefits. Avoid cream and butter to keep it light and low in fat. Try using less pasta to reduce carbs. Instead add more chicken and veggies. Swap regular white pasta for whole grain this also keeps you fuller for longer. Or use rice noodles for a gluten-free alternative. Don’t overcook the broccoli or you will lose a lot of nutrients and become soggy. Crisp, tender broccoli is ideal for this chicken pasta. Don’t have broccoli? Try another green veg such as spinach, green peas, zucchini or kale. Dietary options/substitutions: For GF use gluten-free pasta such as rice noodles. Omit chicken for a vegetarian option. Broccoli florets, lemon juice and zest with garlic, chicken and whole-wheat pasta. Cook desired amount of pasta according to package directions; I used half a package. Cook al dente (firm), remove from heat and drain. Stir in 2-tbs olive oil to prevent sticking. Meanwhile: Cut chicken into ½-inch cubes and toss with lemon pepper seasoning. Heat 2 tablespoons of olive oil in a large pan or skillet to medium-high heat. Add chicken pieces and cook 5-7 minutes, stirring often until opaque and mostly cooked. Turn heat to high and add garlic, saute 3-4 minutes more to lightly brown chicken. Remove chicken from pan. Reduce heat to medium-high and heat remaining olive oil in pan. Add broccoli and saute 3-4 minutes. Do not over-cook as broccoli should be crisp. Remove from heat and stir in lemon juice, lemon zest, cooked chicken and pasta. Serve with Parmesan as garnish. Use the good quality chicken preferably free range for the best flavor. Amount of pasta is suggested serving size. Use more or less if desired. Use shredded or shaved parmesan, instead of powdered, for best flavor. Do not to overcook the broccoli as well as having a mushy texture you'll lose a lot of nutrients. Cut the chicken into even sized pieces so they cook evenly and brown better. No surprise that people like me are wanting to also eat fresh, light and healthy recipes for the new year. This looks amazing. I do have to wait until broccoli is in the season where I live as well. Thanks Jeanette. You can sub with frozen broccoli, but it’s easy to overcook and become mushy. I love the idea of making this as a cold noodle salad. Thanks so much for the detailed instructions and tips for this recipe. Looks just wonderful. Hi Noelle. Thanks so much for the feedback! That means a lot. Love this mixture of nutrients and flavour! Thanks so much Lola. Glad you liked it! This lemon pasta is so full of flavor and delicious! Light and easy! A must try and family favorite! I highly recommend. Wow thanks so much for the feedback Krissy and glad it’s a favorite! Wow thanks so much for the glowing feedback Krissy! This Pasta looks so delish! 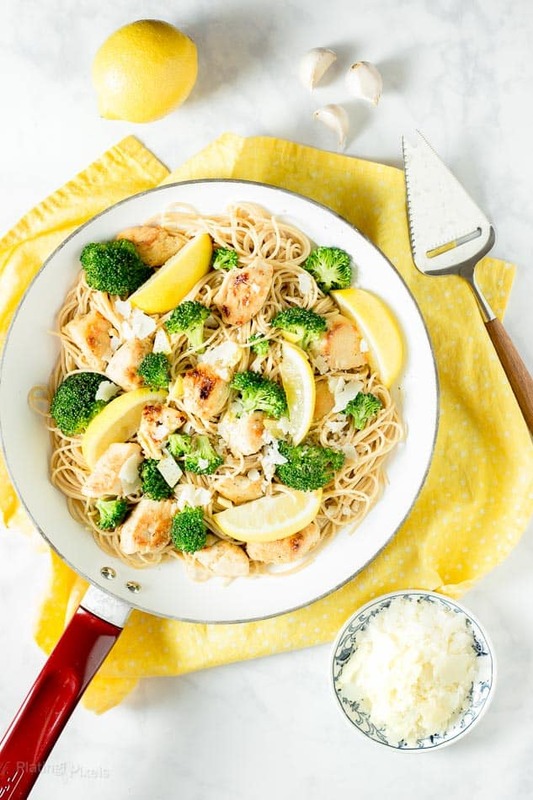 I could only imagine how great the Lemon, Chicken, + Broccoli flavors are together! They totally are. Thanks Shanika! What a great light meal to kick off Spring with! I love how this makes me feel like summer is near. The flavors are just perfect! Thanks for the feedback Claudia and glad you liked the recipe! 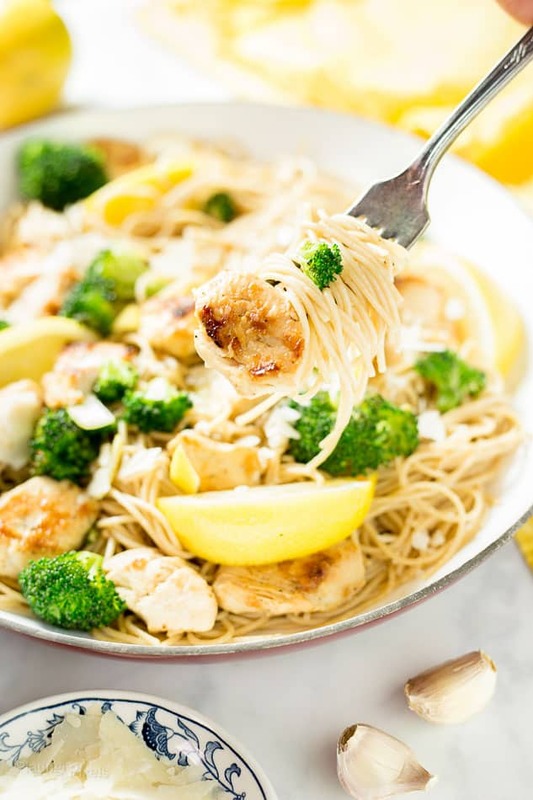 Lemon, chicken and pasta ! Count me in ! Fan of pasta since forever! Love how flavourful this is. I love, love, love me some lemon chicken anything. It’s such a robust flavor – this sounds absolutely mouth-watering. Pinning this to make this week, thank you! I agree it’s a great combo! Thanks so much Kristine. What a delicious idea! I love the lemon flavor in my savory dishes- it just adds such a bright note. I will definitely be making this! Might try it with zucchini noodles. Thanks so much Katie and that’s a great idea! Hi Matt, my name is Dominique and I’m from Belgium. I found your recipe on Pinterest and I prepared it today. Instead of chicken, I used turkey. It was really delicious ! Tomorrow I’ll post my video on Youtube (also on Pinterest, Facebook and Instagram) and I will surely mention I got inspired by you. I will refer to your blog “Platingpixels” in my end credits and description of my video on Youtube ! Checkout my Youtube account tomorrow. Thanks for this delicious recipe ! Hi Dominique. Thanks so much for the feedback and glad you liked it! Will have to try with turkey sometime. I’m sorry but I don’t see in the instructions when you are supposed to add the lemon pepper. Is that supposed to be obvious? (I’m a terrible cook!) thanks for clarifying!! Hi Michele. Thanks for pointing that out and sorry, I must have missed that. I fixed the instructions, but you sprinkle it on chicken before cooking. That looks absolutely delicious! 😀 Mmmmmm. Putting this on the menu this week. Thanks for sharing! I pinned this so I can try it soon. It looks so good!! I’ve been looking for yummy and lighter pasta recipes to try, so this one looks absolutely perfect! Can’t wait to try it out!! That’s great Cathy! Glad I can provide some recipe ideas. I love pasta too, especially if it’s on the healthier side. Sounds like a perfectly delicious dinner! I love how simple it is and I love how fast you can have it prepared! Thanks for sharing. It is super simple and fast, but full of flavor. Thanks Jenn! This looks so delicious. I can’t wait to try the recipe. I hope you do! Thanks Debs! The perfect spring recipe! I am a sucker for pasta! Looks delicious!! I totally agree. Thanks Ruthie! I love cooking and baking with lemon this pasta dish sounds delicious. Thanks Candy. It adds so much flavor! Great! Please tell me can i use tagliatelle, or there is a thin paste should be? Sure Klauss, you could use another style of pasta. I like the thin style for this since it doesn’t overpower the crunch of broccoli and other textures. Thanks! I totally is! Thanks so much Andrea! I love how fresh and light this recipe is. This is a perfect Spring Dinner when eating Al Fresco! I sure is! Just in time for Spring. Thanks Chandra! Looks delicious. I’ll have to pin for later. This sounds fantastic! 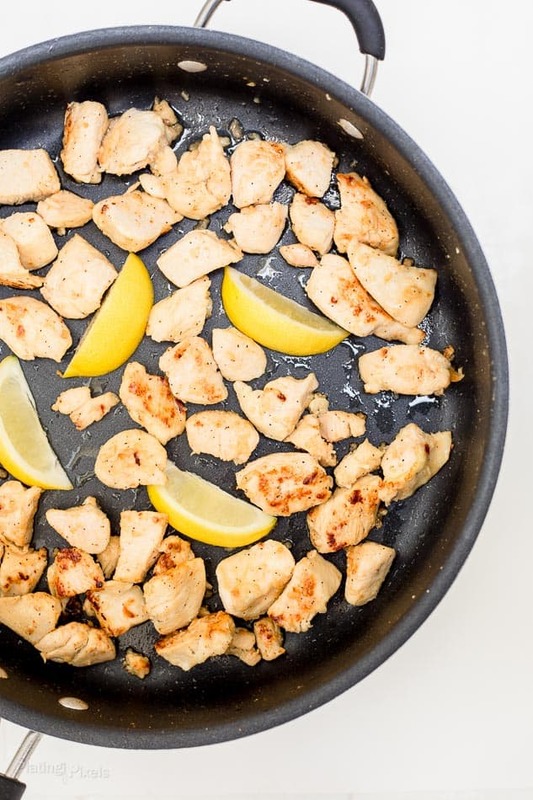 I always love the combo of lemon and chicken together! Don’t be afraid of healthy fats. May I suggest you use coconut oil or avocado oil instead of olive oil since olive oil has a very low smoke point. This looks yummy. I would put it over a bed of spiralized zucchine. Thanks for the suggestion Karen! Those are great options, but as long as you use light olive oil as called for in the recipe you’ll be fine. It has a much higher smoke point than coconut oil, almost 500 degrees. Thanks Stephanie. Love those flavors too. It’s comforting and fresh at the same time. Enjoy! This looks so good and even though I’m not a fan of lemons in food, this is intriguing. I might have to give this one a try. Looks super yummy. You could always use less or just the lemon pepper seasoning. Thanks Jasmin! That’s a pretty good selling point right?! Thanks Becky! Thanks Kristina and hope you love it!